Well, then you have already got part of the answer. The Bramahputra-Ganges system has the highest sediment load, month from month. Most people think only of the Bramahputra OR the Ganges, not realizing that they merge 100+ miles from sea, forming a river with the highest sediment load, however you look at it. Also remember that the Bramaputra and the Ganges ARE rivers originating in a glaciated area. Together, they have the highest sediment load season by season. What type of rocks are these? JimBob- no one seems to be willing to venture a guess? Must not be many earth scientists hanging about lately? Nice, clear photo. The outer folded layer appears to be either quartz or quarzite (could also be calcareous?). Can't quite make out the inner rock- even though the white specks (feldspars, clastic fragments?) 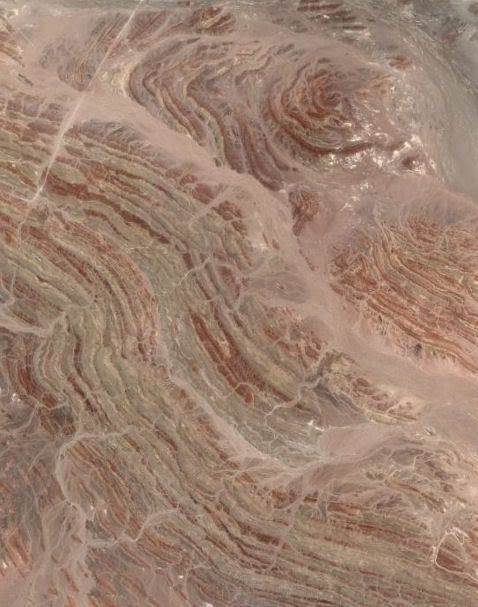 seem to have no preferred orientation- I would guess sedimorphic (a new geologic term!) - metamorphosed clastic rock. Could also be some sort of subvolcanic igneous- perhaps a latite- but that may be my hard-rock bias showing. The outer one is a PEGMATITE !! - I know that the inner part of the fold is hard to see (it is a high silicate rhyolitie) so if someone got "pegmatite" I wasn't going to carp about it. 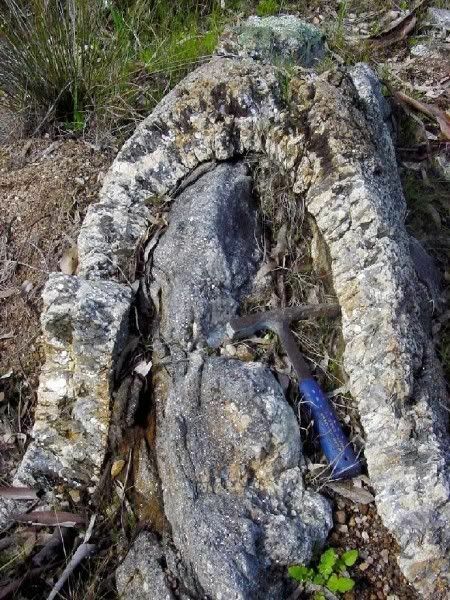 The highly crystalline nature of the pegmatite can easily be seen. The formation of the crystals on the inner sides of the fissure with crystallization evolving inward until the gap between sides is closed. Perhaps I'll find some picts that are easier. What place is considered to be the place most damaged by the largest earthquake in recorded history? It was an estimated 9.4 magnitude earthquake. 2004 Indian Ocean earthquake and tsunami was 9.0, and the one this question is about is, by most, considered much larger. I wasn't around for the largest, but I was in Alaska for 2nd largest in 1964. Since the Indian Ocean quake Alaska is now #3. But dang, Bass, you are almost as old as I am. The pictures of the damage on TV were in black and white! For a hint on the question, refer to your "where in the world." Sorry JimBob, I didn't phrase that very well. I was but a young lad, and remember the b&W pictures on a very small neolithic TV. What I meant was that I wasn't in the vicinity of this earthquake, I was way too far north- and news traveled much more slowly in Alaska during those days. According to the USGS, Alaska is still #2. The Lisbon earth quake of 1755 is the one I was looking for. 35% of the population was killed in Lisbon, 10,000 in Morocco. The resultant tsunami affected southern England, Galway, Ireland and the Antilles. It is estimated by some seismologists to have been well over 9 on the Richter Scale. Oops- thought you were referring to the Chilean earthquake (M 9.5) in May 1960.
aerial photo of desert landscape with flat-lying beds. Somewhere in Utah perhaps? Is the white snow? Can see a road in the upper left corner. The satellite picture is of an area about 95 mile SW of Muscat Oman. Bass is correct about the desert landscape and sediments. But the wadi (valley) cutting across the shot is pretty obviously in a thrust fault expression. The white is possibly salt. There is a lot exposed here. as to the red sandstone, its very common in the uk, because we used to be on and around the equator, at around 50 degrees we were in a desert environment. the action of the sun made the rock much darker red in colour and the green has got to be copper because green marks arent left by any common tree from the tertiary when the climate was that of a desert...the sandstone deposited in the uk has laminations if found on a grand scale.. the fact that the red sandstone has laminations ( deposited in dunes ) means that a tree could not survive in a sand environment alone. its got to be from the element. it wouldnt be discolouring, because in sandstones the only form of discolouring is bleaching, where by the action of water removes the oxide and leaves it white ! did you know that after the big lisbon earthquake of 1755 the only building in the city found to be standing was a brothel . to the comment about alfisol soils id like to add that soils are a completely different matter as red, iron-rich subsurface horizons are only characteristics of soil and a red desert sandstone is of that name because it is lithified sand grains cemented together by silicon or various rarer types, which have been turned red ONLY by the action of the sun. If we are talking about soils its a completely different matter ! Which river carries the highest sediment load? .... i reckon its got to be the Amazon ! i know that it transports 2 billion tonnes of particles from the andes every year over to Africa. the Andes is the fastest growing mountain range and my favourite apparently, according to extremescience.com For the last century the Amazon and Nile have been fighting over the title for the world's longest river. the length of them both varies across time, not sure how, but it says that the amazon carries the most amount of water. now thats got to be something... ? you know, this is a really interesting picture : the rock's awesome ! im actually going to have a guess at its formation, but id like to know where the location is...? the rock in the middle is a hard rock but id guess its been metamorphosed , it probably was a mudstone at the bottom of a deep sea and then the calcarous stuff was laid on top,i think the fact its now on land would suggest isostasy was at work and it used to be in a warm tropical climate where the calcium carbonate limstone was laid down. it looks like it has a very high silica content but that could be metamorphosed Calcium Carbonate to make it marble- like .do you know what the rock is btw, ?